Image Size: 26" x 16.5"
Paper Size: 32" x 22.5"
On March 9, 1916, Mexican revolutionary Pancho Villa and 500 of his Villistas attacked the border town of Columbus, New Mexico. The United States responded by immediately dispatching U.S. Army forces under the command of General John J. "Blackjack" Pershing to avenge the border penetration and capture the bandit Villa. 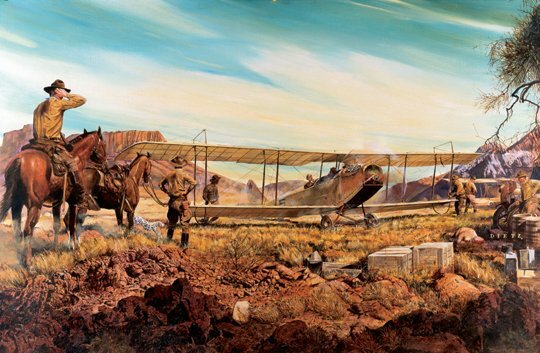 Pershing deployed eight Curtiss JN-2s of the First Aero Squadron for use as scouts in the mountainous Mexican territory to which Villa and his men had fled.